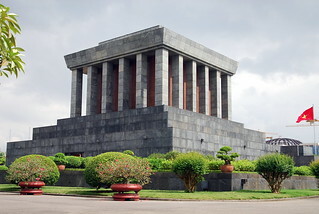 In Hanoi rests the body of Vietnamese revolutionary leader Ho Chi Minh in a large mausoleum in the centre of Ba Dinh Square.Uncle Ho, as he is affectionally regarded by supporters, led the revolution against the colonial french and governed the Democratic Republic of Vietnam (North Vietnam) from 1945 to 1969. You can view Ho Chi Minhs embalmed body (which we did) under heavy gaurd from the Army. Along side the mausoleum are the grouds of the presidential palace, the home where Ho Chi Minh worked and lived and a garage containing cars giften to Ho Chi Minh by the Soviet Union. I am not going to comment on the war, the revolution led by Ho Chi Minh or communist politics. It’s also a bit difficult to research the matter as much of the western mainstream internet litreature refers to the Vietnamese view of Ho Chi Minh as part of a Communist Party propaganda drive meant to idolise the figure and thus maintain support for the party. They cite the Government’s supression of information about Ho Chi Minhs romantic life as proof of this. And yet would they say the same about western leaders glorified by their nation, leaders who led wars against other countries (rather than a reclaimation of their own) resulting in hundreds and thousands of deaths?